As many of you probably know, a new version of the Thesis theme (1.7) was released recently with a whole host of new options and features. One of those features is a built in settings importer which makes installing skins an insanely quick process. To celebrate, I’ve decided to release my 5th free Thesis skin. This one’s a little bit more playful in nature but I think you’ll enjoy it, especially if you’re a fan of the social media site, Twitter. As you can see from the demo site, this skin is designed to give your readers just a small taste of the content you have to offer in a relatively simple and easily digestible form. It automatically truncates the post excerpts to 20 words (a total you can tweak via the custom_functions.php file), strips out any possible line breaks to keep the formatting nice, and presents the posts as if they were tweets. 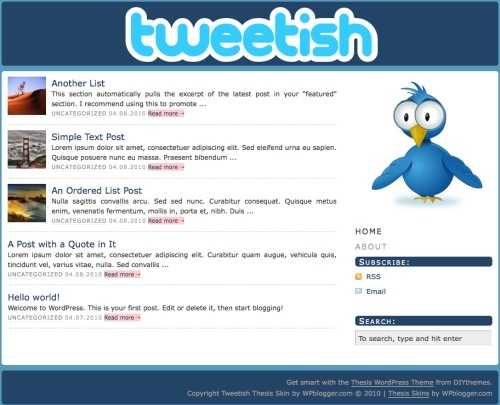 The skin also includes a widgetized bio area where the nice picture of the Twitter bird is located on the demo site. This makes it easy for you to include a picture of yourself, a short description, or both! The finishing touch was to round the corners of all the major content blocks (header, content, footer) to give the skin that nice mellow feel to it. The only requirement for using this skin is that you’ve purchased and installed a copy of the Thesis theme, version 1.7. As I mentioned earlier, installation is even easier thanks to version 1.7! Just enter your name and email address in the form to the left (make sure you any ad-blocking turned off) and be sure to confirm your request for the skin. We aren’t going to spam you, we just want to be able to alert you to new skins or updates of old ones. You’ll receive an email with a link to the zipped skin files. Unzip the files, drop the custom.css and custom_functions.php files into the Custom folder of your Thesis install. The folder should be located somewhere like yoursite.com/wp-content/themes/thesis/custom. Warning: The next step will overwrite any of the settings you may have already customized. I’d recommend creating a backup All Options file in case you decide you want to go back to your current settings at any point. Next you need to navigate to the Manage Options page under the Thesis heading in your left sidebar. In the middle column (Upload Options) go to the bottom field (All Options) click the Browse button, find the thesis-all-options-20100408.dat file, and click the upload button. And believe it or not, that’s it. I told you it was easy! Customizing the skin is fairly easy as well. I’ve left comments in the custom.css file to show you where to enter the URL for your own custom header image, and the Bio section is widgetized which makes customizing that a snap. As I mentioned earlier, if you’d like to have more than 20 words of each post displayed, you can tweak that setting in the custom_functions.php file. With a relatively simple skin like this, I’m sure you guys and gals will come up with some great customizations so be sure to come back and share them with us in the comments below. In fact, I’ll start us off with one. My personal site, Skitzzo.com is a slightly customized version of this skin. Hopefully that will get your creative juices flowing. Ooh, I love it! This would be perfect for my blog, Recipe in a Tweet – and now I’m inspired to start tweet/blogging again, thanks! This is a great addition to an already growing number of free thesis skins. Great work. I absolutely love it! Many thanks for this great skin! I am not a code guy… so this was a great find for me. I was able to easily set up a simple site to help market our house. Check out the slide show in the nav bar to see the place. Sort of fits for my tweets at twitter.com/1223EvaRoad. Looks really cool! great work! but where is the download link cant seem to find any download link to the theme? kerwin, make sure you turn off any ad blocking software you have running. I’ve been told that blocks the registration form. Hi there – The skin is great – I really like it – BUT – I’m not pulling the thumbnails on the front page along with the excerpts? Is there an extra step…..or are these generated automatically? Thanks, this will be perfect to give an old blog of mine a cool re-boot. love the theme, fails miserably in Thesis 1.8.2, any chance it will be updated?